Automate testing for MISRA C:2012 directives and rules. 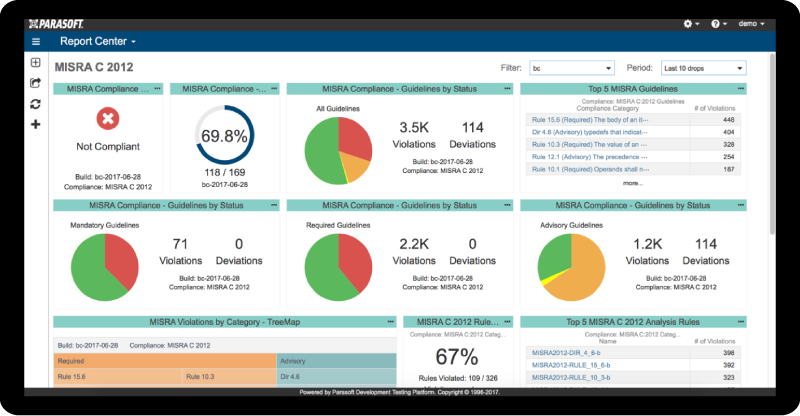 MISRA C:2012, has evolved over several years and includes 143 rules and 16 directives for a total of 159 guidelines. Amendment 1 to MISRA C:2012, published in 2016, expanded the standard by 14 rules. The MISRA standard provides a set of best practices for writing C code, facilitating the authorship of safe, secure, and portable code. Parasoft C/C++test automates C and C++ static analysis, peer code review, and unit and component testing on host and target with comprehensive code coverage supporting all the common versions of the MISRA standards including MISRA C++ 2008, MISRA C 2012, and MISRA C:2012 Amendment 1 security guidelines. In this paper, learn how Parasoft C/C++test can streamline your deployment and help create safe, secure, reliable software required by ISO 26262 and MISRA.